The Kerry Senior Hurlers have a home game in the Joe McDonagh Cup competition on this Sunday when they meet Laois at Austin Stack Park. The game is fixed for 3.00p.m. A win is vital to get their campaign back on track after the disappointing 3 point away loss to Carlow last Sunday, 0 - 21 to 0 - 18. Forthcoming fixtures in this new Tier 2 hurling competition are: Sunday, 20 May v Westmeath (home, 3.00p.m. ); Saturday, 2 June v Meath (away) and Saturday, 9 June v Antrim (away). The final is fixed for the weekend of 30 June. In Round 1 of the Celtic Challenge Under 17 Hurling competition played at Templeglantine last Wednesday, Kerry had a 3 - 17 to 1 - 10 win over Limerick Sarsfields. In Round 2 on this Wednesday, 9 May they meet West Cork at Aghabullogue [near Coachford] at 7.30pm. The Féile Under 14 Kerry Skills Hurling competition will take place on Thursday week, 17 May, 6.00pm at the John Mitchel’s G.A.A. Complex. 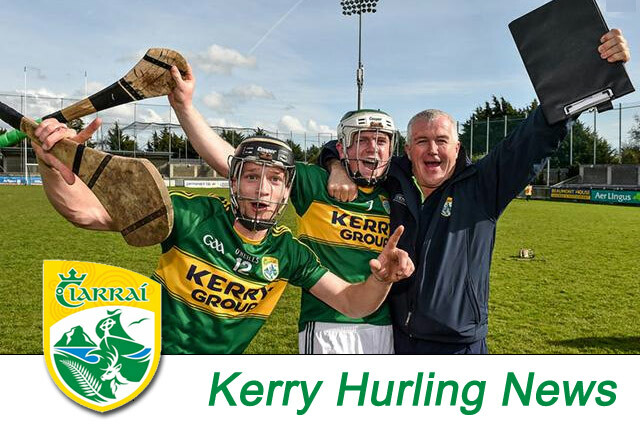 All hurling Kerry Clubs are invited to send one representative. The winner will qualify for the National Final which takes place in Dublin on Saturday, 23 June. The County Féile na nGael Under 14 hurling finals went ahead at Abbeydorney on Monday last with results as follows: Féíle ‘C’ Final - South Kerry 3 - 4 Tralee Parnell’s 1 – 3; Féíle ‘B’ Final - Lixnaw 0 - 14 Ballyheigue 0 – 9; Féíle ‘A’ Final - Ballyduff 4 - 12 Kenmare/Kilgarvan 0- 2. The winning team from each Group will take part in the National Féile na nGael competitions to be held in Galway/Mayo on the weekend of 8 – 10 June. Ballyduff will be hosted by the Ardrahan club; Lixnaw will be going to Ballindereen while South Kerry will be travelling to Claremorris. Lee Strand County Under 16 hurling results: Division 1 play-off - Kenmare/Kilgarvan 4 - 14 Crotta O'Neill's 1 – 7. Semi-finals - Kenmare/Kilgarvan will play Ballyduff and Ballyheigue meet Abbeydorney. Division 2 semi-final - St. Brendan’s 4 - 15 Tralee Parnell’s 3 - 5. St. Brendan's play Lixnaw in the Final. Full fixture details will be on the Kerry Coiste na nÓg Facebook page. The Lee Strand Under 12 hurling competitions continue with Round 4 on this Friday, 11 May with all games at 7.00p.m. Division 1 – Crotta v Ballyduff; Lixnaw v Tralee Parnell’s; Kenmare/Kilgarvan v St. Brendan’s. Division 2 – Rathmore v Causeway; Kilmoyley v Ballyheigue; Abbeydorney v Kenmare/Kilgarvan B. Division 3 – St. Brendan’s B v Tralee Parnell’s B; Crotta B v Firies; Kenmare/Kilgarvan C v St. Pat’s/Dr. Crokes. John Ross (Ballyduff) is the co-ordinator for this competition. Results of the quarter finals of the North Kerry Intermediate Hurling Championship from last weekend: Causeway 2 -19 Lady’s Walk 1 – 5; Lixnaw 1 - 13 Ballyheigue 0- 8; Kilmoyley 0 - 23 Abbeydorney 2 – 11; St. Brendan’s 4 – 9 Crotta 2 – 14. The semi-finals go ahead this Friday, 7.00p.m. – Lixnaw v Causeway at Lixnaw; St. Brendan’s v Kilmoyley at Ardfert. In the North Kerry Minor Hurling League Division 2 play-off game, Lixnaw, with 2 late goals, had a 2 - 10 to 0 - 15 win over Tralee Parnell's. Lixnaw now meet Ballyduff in the Final.